Analysis by Lebanese activist Magida Salman on the political psychology of the different warring sects within Lebanon, and how, even before the Israeli invasion, the country's body politic had disintegrated massively, with distinctions between left and right being drowned in the blood of sectarian killings. Will the election of Arnin Gemayel as president of ‘all of Lebanon’ finally put an end to the ghastly pageant of civil war in that country? Many Lebanese hope so, but their desires are as mangled and bewildering as were their heroes of yesterday – or their martyrs, whose portraits still cover the bullet-ridden walls of Beirut. Seven years of wars great and small – all of them waged by all camps in the name of victory, with Muslims, Christians, leftists, and rightists ever flashing the V sign – have forged myths and reinforced them. Chief among these is the myth of Lebanon ‘the way it used to be’, that battleground of two rival visions, on the one hand the three b’s- brothels, banks, and brawls – on the other the crossroads of civilisations, Switzerland of the Middle East. The old Lebanon, in which pro-Western and Arab nationalist outlooks vied with one another, is now becoming an object of joint nostalgia: the lost paradise that must be regained at any price. Lebanon’s population now believes that it faces a choice between a strong state and the anarchic and arbitrary rule of rival armed groups and neighbourhood gangs. The former option seems to be carrying the day, at least for the moment. This view is shared by the various religious communities. Christians of all sects, Sunnis, Shi’is and Druzes have suffered the same calamities and identical violent daily tragedies, and each community has drawn its own conclusions. These remain divergent, but they concur in the desire to rebuild an everyday life that approximates normality. By forcing the Palestinian resistance to leave Lebanon, by destroying those buildings that were still standing, Sharon’s army has offered the Lebanese an opportunity to weave illusions about a future peace that will not be without its scapegoats: the Palestinian population of the refugee camps. The Christian community in Lebanon, although heterogeneous in its class structure, has nevertheless always been united in its feeling that it constitutes a threatened minority and in its need to assert its specific identity, which it calls Lebanese. A statement by Bashir Gemayel epitomises this sentiment: ‘We were under attack as Christians, we defended ourselves as Lebanese.’ Such is the Christian conception of Lebanese nationalism, intransigent in its opposition to Arab nationalism, which the Christians regard as a clear and present danger menacing their traditions and culture (which, however Arab it might be, is nevertheless non-Muslim). The Christians saw Nasser’s Arab nationalism purely as a threat, to integrate Lebanon into a ‘rapacious Islamic entity’ within which the Christians of Lebanon would enjoy the same unenviable status as the Iraqi Christians or the Egyptian Copts. The choice confronting the Christian community in Lebanon seemed to be defined in stark terms: Islamisation or Westernisation. The Christians of Lebanon have long gazed westwards with affection. Their oppression during the Ottoman era (the Porte cleverly playing on Muslim unity in an effort to cement its rule), as well as their economic marginalisation (paralleled by that of the Armenians), encouraged them to look in directions in which the sea afforded openings the Ottomans lacked the power to block. To this day the nationalism of the Lebanese Christians is imbued with the heroic memories and romantic literature of the struggle against the ‘Turkish oppressor’. The attitude to France was not so one-sided. Although French competition crushed the Christian silk workshops of the Lebanese mountains, which were unable to meet the challenge of the city of Lyon towards the end of the nineteenth century, the French won the gratitude of the mountain populace by making their future friends the merchants for the silk trade, and soon for other commodities as well. The defeat of the Ottoman Empire in the First World War and the formal Allied recognition of French hegemony in the post-war order transformed the status of the Lebanese Christians from one of a cautious minority to a majority fiercely defending a new political system and national borders that entailed privileged representation in the ruling institutions of the Lebanese state. Ever since the establishment of the National Pact in the mid-forties, the Christians have viewed the confessional structure of the state as synonymous with its very existence. Whether they were workers (and 45 per cent op the Lebanese working class was Christian, especially Maronite, on the eve of the outbreak of the civil war), rich traders, or petty bourgeois, the Christians saw what they called the ‘Lebanese formula’ as the only alternative to their absorption into the dominant Arab-Muslim current of the Middle East. Hence the label ‘isolationists’ slapped on them by the ‘Islamo-progressive’ forces during the civil war. This tendency to confound the very existence of any Lebanese state with the confessional partition of the state power was especially deeply rooted among the Maronites, while the Greek Orthodox Christians enjoyed neither such a healthy slice of the pie nor the same history of struggle in the Lebanese mountains. But the dynamic of the civil war itself, although it concentrated political power in the Christian sector in the hands of the largely Maronite Phalangists, paradoxically integrated the adherents of Greek Orthodoxy more closely into the Christian community. The mortars, bombs and bullets slung back and forth indiscriminately between Christian and Muslim neighbourhoods made no distinctions between one sort of church and another, or between one sort of mosque and another. When the feeling of being subjected arbitrarily to sudden death becomes paramount, it is difficult not to come to believe in the forces shooting at the other side from your own neighbourhood, whoever they may be. Like any minority seeking to preserve its own specific character in the face of a perceived threat, the Christian community combined hatred and contempt for their adversary: Arabist Islam. The ideology that embodied this sentiment saw itself as based on so-called Western values: ‘We represent European civilisation in this backward and under-developed corner of the world’. ‘At least our men don’t marry four wives’. But these European pretensions nevertheless remained firmly anchored in the Arab Mediterranean reality of which these same Christians so clearly are part; pure and simple confessionalism, and belief in a highly politicised god and church are themselves characteristic of that reality. After 1967, the Palestinians, most of them Muslim, were no longer ‘only’ refugees in Lebanon. They became a political and military force that bolstered the ‘Arabist’ camp, the exponents of a cause that was more Arab than Lebanese, a cause that was intermingled with that of Egypt, Syria, Jordan, and other Arab states. The Phalangists, representative par excellence of Christian Lebanism, became the vanguard in the counter-attack against ‘this new reality’. The little wars and armed clashes that erupted sporadically between Phalangists and Palestinian organisations – rather coyly known as ‘events’ and resulting regularly in handfuls of injuries here and there – heralded the big ‘event’, the civil war that broke out in the spring of 1975. The Palestino-Muslim camp was always far more heterogeneous than the ‘Christian camp’. Hence the fluid, vague – and false – appellations that were attributed to it: ‘Islamo-progressive’, ‘progressive forces’, or ‘nationalist forces’. Among the components of this camp were the Sunni Muslims, their allegiance divided among the traditional Muslim leaders (like Saeb Salam and Rashid Karameh, two former prime ministers), various Nasserist formations, the largest of which was the Murabitun, and various rival Ba’thist factions. The Lebanese left (Jumblatists, the Lebanese Communist Party, the Communist Action Organisation of Lebanon) joined – or rather, merged with – this component. The Lebanese Sunnis were as heterogenous as the Christians in their class composition, except that the proportion of workers was even smaller among this Muslim community. Their integration into the Lebanese economy paralleled that of the Christians and was similar to it. In the realm of ideology, however, things were completely different. The Sunnis had no phobia against the Syrians, Egyptians, and other Arabs and could afford to flirt with the idea of Arab unity. Large photographs of Nasser were proudly displayed in the streets of West Beirut along with, less frequently, this or that Ba’thist leader in the act of praying with some Sunni personality from Beirut or Tripoli. But the Sunni elite lacked the political instruments with which the Maronite leaders were endowed. They had no political party in the modern sense of the word. The relationship between voters and leaders thus remained more traditional, resting not only on the inherited authority transmitted from father to son within the ruling family, but also on the patriarchal or tribal relationship between representative and represented. This element is essential in understanding the proliferation of dozens of armed groups and grouplets and the power acquired by their ga’ids in the streets of West Beirut. Historically, southern Lebanon was by-passed by the anarchic development of the country. An agricultural region dominated by the cultivation of tobacco – in small plantations of peasant families or agricultural workers employed by large landlords – southern Lebanon remained one of the most disadvantaged regions of the country even after the Second World War and the boom of the sixties. Until that decade, the super-exploited peasants of the South never questioned their loyalty to their traditional leaders, the scions of rich families. These families garnered fat profits either by directly appropriating the produce of these peasants or by selling it to the state tobacco monopoly. These profits were never reinvested in the South but were put into commercial transactions and companies headquartered in Beirut. Despite this, the families of notables – Assad, Zain, etc. – remained masters in the South. The persistent Israeli attacks after 1967, along with the great migration of Shi’i workers to the cities, especially Beirut, where they formed a pool of cheap or perenially unemployed labour huddled together in large families in the periphery of Beirut, eventually transformed the political climate within the Shi’i community and thereby within Lebanese Islam. From the early seventies onwards, Imam Musa Sadr, religious chief of the Shi’i community, forged his popularity out of this base, first in the South and later in the suburbs of Beirut. In the best Shi’i tradition, he launched a movement of the mahrumin, the ‘dispossessed’. It was an essentially populist movement whose vague social demands were married both to religious masochism (self-flagellation ceremonies during ‘Ashurah) and to the more general sentiments of a deprived and neglected community. This movement, whose slogans and statutes (an assembly around a religious chief) were easily adaptable to the political consciousness of poor peasants and workers freshly crammed into the Beirut suburbs, had little difficulty reducing the left organisations first to secondary competitors and then to enemies within the Shi’i community. With the civil war, the movement of Musa Sadr (called Amal, or Hope) grew apace in both size and force of persuasion, for the war drastically worsened the conditions of the poor layers of Shi’is, who rapidly lost even their status as workers and peasants, and became instead mere groups of refugees, now fleeing the South as a result of Israeli attacks, now pouring out of their densely populated neighbourhoods in and around Beirut, caught in the fighting between the enemy factions in the civil war. The example of Naba’a, a neighbourhood adjacent to the Palestinian camp of Tel al-Za’atar, is illustrative. At the start of the war it was an agglomeration of insalubrious buildings and shanties often inhabitated by as many as a dozen people each, an enclave in Christian East Beirut, most of whose population were Shi’i workers, with a small minority of poor Christians. At the beginning of the civil war, the inhabitants of Naba’a supported the various organisations of the Palestinian movement or of the Lebanese left, which had located their central headquarters in this geographically strategic neighbourhood. But the longer the war dragged on, as the bombing and shelling took their mounting toll of lives and a stifling blockade strangled the neighbourhood, the more the enthusiasm of the inhabitants of Naba’a gave way to rancour. The organisations of the ‘Islamo-Palestinian left’ cared little about the problems faced by the local population in their daily civilian life (housing, food, and so on), and acted exclusively in the military domain. Shi’i communal sentiments were inflamed again, and flared higher when Musa Sadr established a small hospital in the neighbourhood, in sharp contrast to the politico-military organisations, which had spent money only on arms. Soon afterwards, when Naba’a fell to Phalangist assault, the Shi’i population did not resist; in a battle between rival ‘occupation forces’, the neighbourhood’s inhabitants felt themselves unconcerned. This involution, the last resort of self-identification, spread and deepened as the Shi’i masses were increasingly transformed into permanent refugees finding no place to house their families except in miserable agglomerations in the proximity of Palestinian camps. Amal, the Shi’i movement, made ever wider use of its arsenal, which turned out to be far from negligible. After 1980, the political and military life of Beirut and the cities of southern Lebanon was dominated by battles between Amal and the Palestinian organisations and between Amal and the Lebanese Communist Party. A new dimension was added to the already intricate amalgam of religious sects, currents, and politico- military organisations in Lebanon. ‘With the introduction of arms, a radical change in roles occurs. Weakness becomes strength. The weapons acquire an exaggerated, almost magical, quality: a defence and a shield, the symbol of a new identity. Hence the vanity of the oppressed man displaying his weapons. It is an exhibition of that new existence which has finally put an end to resignation… and thus it is that the act of liberation, unless organised and channeled, is transformed into a kind of magical revolt. It is as if liberation itself consisted in the act of bearing arms, which has opened the way to individual liberation… The inferiority complex cedes to the superiority complex, the complex of submission to that of omnipotence. The old complex of non-identity, the status of lack of status, gives way to the status of exceptionality. 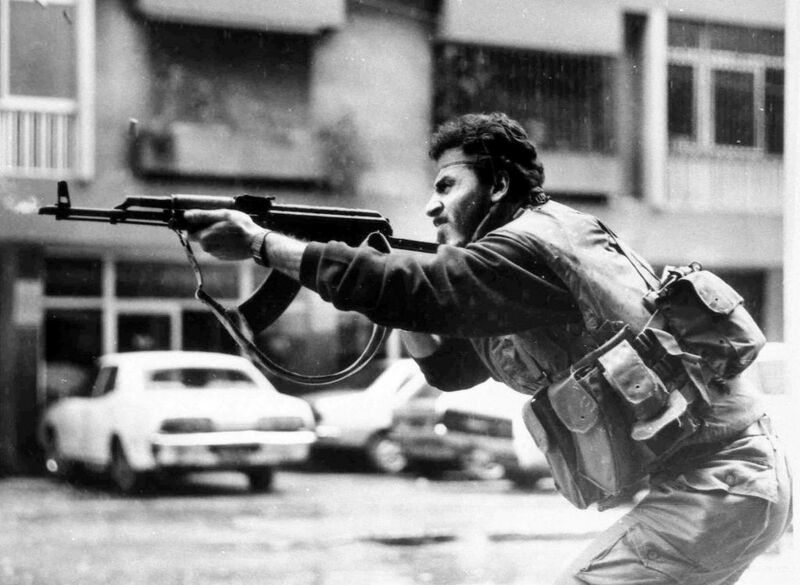 For the oppressed man who has taken up arms, anything is possible, including any excess’ (Mustafa Hijazi, Al-Takhalluf al-Ijtima’i: Madkhal ila Sikolojiat al-lnsan al-Maqhur, Arab Development Institute, Beirut, 1976). To sum up the atmosphere that prevailed in the streets of Lebanon during the civil war, it is sufficient simply to observe how this ‘psychology of under-development’ operated in practice and determined the fate of the Lebanese population. A ‘state of exception’, not decreed by a dictatorial state but brought about by a multitutde of tiny dictatorships, destroyed the life of the country’s inhabitants during the civil war, and constituted the only politics the Lebanese actually experienced. On the one side were the civilians, the victims of both camps, and on the other those who bore arms, the members of the politico-military organisations that enforced their own law. Within just a few months of the outbreak of the civil war, that law had become the survival of the fittest, or of the best armed, a sadistic and arbitrary regime under which the whim of this or that gang, this or that powerful individual, could and often did decide the fate of any person’s life and property. Auto theft, burglaries and robberies of houses, harassment on the street-corners, where the militants of the various politico-military organisations would establish their barricades and search, pester, insult and sometimes murder passers-by – these things, little by little, came to constitute the bulk of the activities of the members of political organisations, when they were not simply engaging in indiscriminate shelling of the ‘enemy’ neighbourhoods. On the other hand, these same organisations protected the neighbourhoods in which they were based against eventual murderous attacks by ‘the other side’. The result was an agonising contradiction for the helpless populace. ‘The local thief is our protector’ was a frequent lament, discreetly voiced, in both Lebanons, Christian and ‘Palestino-Muslim ‘. In the Christian part of Lebanon, or at least in East Beirut, the Phalangists slaughtered their opposition with sufficient ruthlessness to create a unified order, a state controlled by the dominant Phalangist militia. Such was not the case in West Beirut, Tripoli, Sidon and other cities, where the militias gave rise to dozens of mini-states, often competing with one another for control of even the smallest neighbourhoods. In East Beirut, for example, the Phalangists alone taxed the population, after their victory over the other Christian militias. They were thus able to impose taxes according to some regulation, as the Lebanese state had done previously. Although the inhabitants of East Beirut complained about militia-law, they nevertheless felt that a single strong militia was preferable to ‘the anarchy that reigns on the other side’. In the West, Muslim Lebanese increasingly came to envy the security that had been imposed on the Christians in the East. There were more and more complaints about the competition between rival militias, the cost of which was paid by the population in fear and human life. The Syrian army itself acted as just another militia along with all the rest, one that used its influence to intimidate the population the better to participate in the multifarious exactions the militias had made their way of life. It was not long before the old reflexes re-asserted themselves. The most facile outlet for frustration is to blame all the trouble on the Palestinians, who are after all not Lebanese (and the PLO, moreover, flaunted its friendship with the heartily detested Syrian army), even though their behaviour was not a whit different from that of the ‘Islamo-progressive’ militias. A double language thus took root in ‘Islamo-Palestinian’, or ‘Islamo-progressive’ Lebanon. Hate-filled denunciation of the Palestinian Resistance and the Palestinians themselves was voiced in private, while publicly the press and the militias repeated the immutable slogans: ‘Lebanese-Palestinian solidarity’, ‘Lebanese-Syrian solidarity’. Even Berri, the leader of Amal, declared ceaselessly in the press that his organisation stood side by side with the Palestinian resistance in its struggle against Israel, whereas in reality that organisation was waging an equally relentless armed battle against the Palestinians in southern Lebanon and in the neighbourhoods of West Beirut. The Israeli invasion, with its thousands of victims in the space of a few weeks, with the devastation of cities by bombing and shelling, put an end to the slew of permanent little wars that had come to constitute the daily life of the Lebanese population. For most of that population, the available choices were as pressing as the shock was terrible. On the one hand was the strong state, whoever might stand at the helm, on the other not merely anarchy, but the real possibility of an even more sweeping devastation. But the peace longed for by the population is fragile. The Israeli and Syrian armies stand head to head, exchanging angry looks and communiques, threatening to resort to more lethal projectiles. The future of the regions controlled by these two occupying powers is impossible to predict. Confessionalism, further inflamed by the war, is once again rampant in these areas. In the Israeli-dominated region, Druze and Maronites savagely attack one another sporadically but continually. In the Syrian-dominated regions of the north, warfare between Sunni and Shi’i Muslims erupts from week to week. Both occupations have imposed their own law, but neither has brought about order. Only in Beirut, where the international forces (Italian, French, American, and British) are stationed, has there been a modicum of peace. But even there, it is doubtful whether the return to normality will be able to survive the withdrawal of the foreign troops, for none of the factors that caused the little wars of the Lebanese has been resolved by the civil war or by the subsequent outside intervention, from whatever quarter.